1993 marked the fourth decade of America's sports car with a very special commemorative edition- the 40th Anniversary Edition. This was an option package that was made available on all 1993 Corvette models, Coupe, Convertible, and ZR-1. 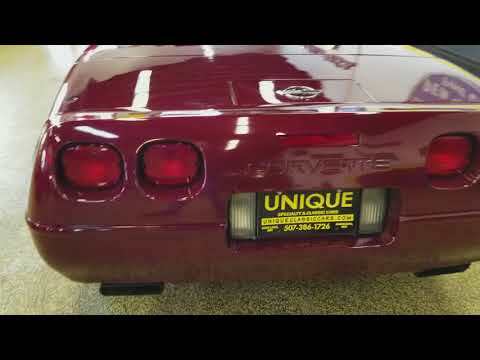 All 40th Anniversary Edition Corvettes (and only 40th Anniversary Edition Corvettes) are Ruby Red from the inside out. With a unique deep-shining metallic, special 40th anniversary emblems, and stunning ruby red interior, these Corvettes truly are a celebration of Corvette history. With 40 years of heritage and refinement behind it, the 1993 Corvette was the classic American two-seater. Corvette;s 5.7 Liter LT1 V8. This 300 HP V8 combines smooth in-city performance and ferocious capability at high RPM, with either the 4-speed automatic or the 6-speed manual, this is driving the way it is meant to be. Technology in the 1993 Corvette also includes sophisticated fully independent suspension with precision-crafted aluminum componentry, an all-disc-four-wheel anti-lock brake system, and a traction-control system that helps Corvette utilize all available traction by regulating wheel spin. And asymmetrical, unidirectional 17″ Goodyear Eagle GS-C tires help deliver precise response to driver input. This particular 40th Anniversary Corvette has only 26,798 miles. It has a clean Carfax confirming mileage and no accidents. The car appears to be all original and has not been modified. Take a look at the pictures and you'll see the great condition this car is actually in. The underside is nice and tidy, interior and leather are in beautiful shape, engine compartment is clean, paint has a nice luster to it and is free of major dings, dents or scratches. Please feel free to give us a call at 507-386-1726 with any questions you may have. You can also email "sales@uniquemankato.com" ALL TRADES WILL BE CONSIDERED FINANCING IS AVAILABLE!